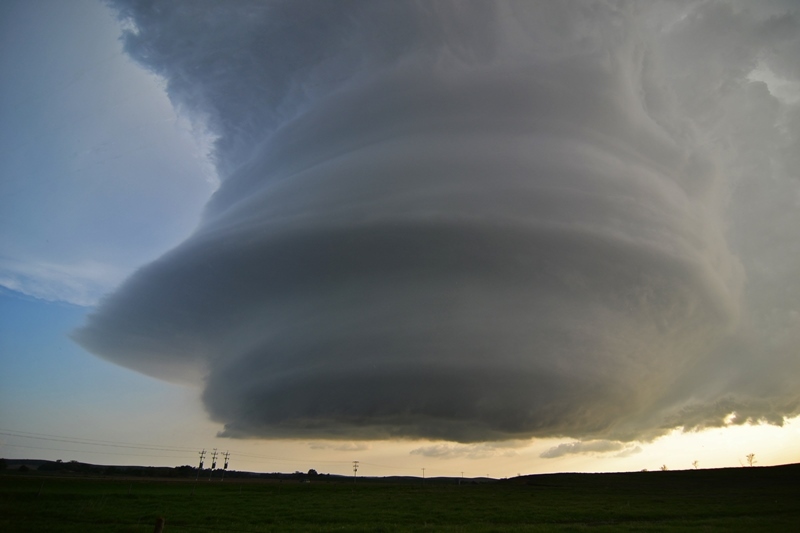 MAY 26TH NEBRASKA - STORM STRUCTURE OF THE YEAR! 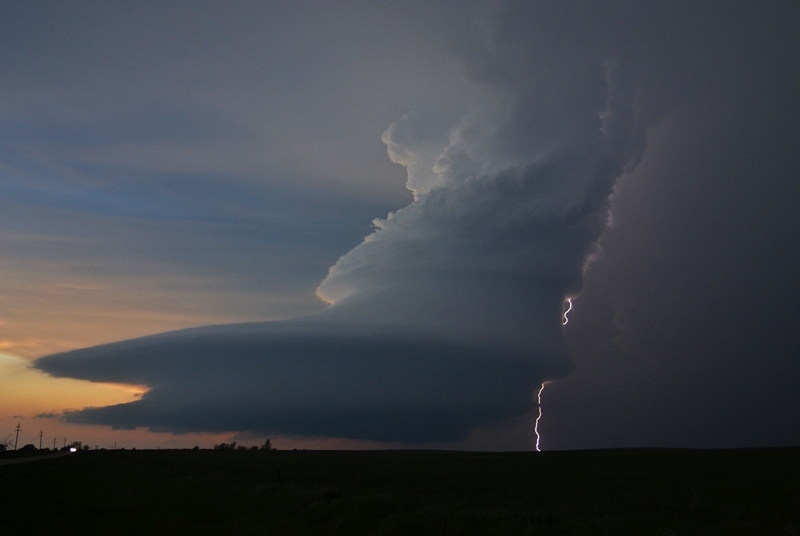 Supercell exploding while train runs for cover near Berwyn, NE. Intense, explosive updrafts on the storm near Ansley, NE. The right updraft eventually took over. Underneath the storm updraft as it starts to get a more defined look to it. 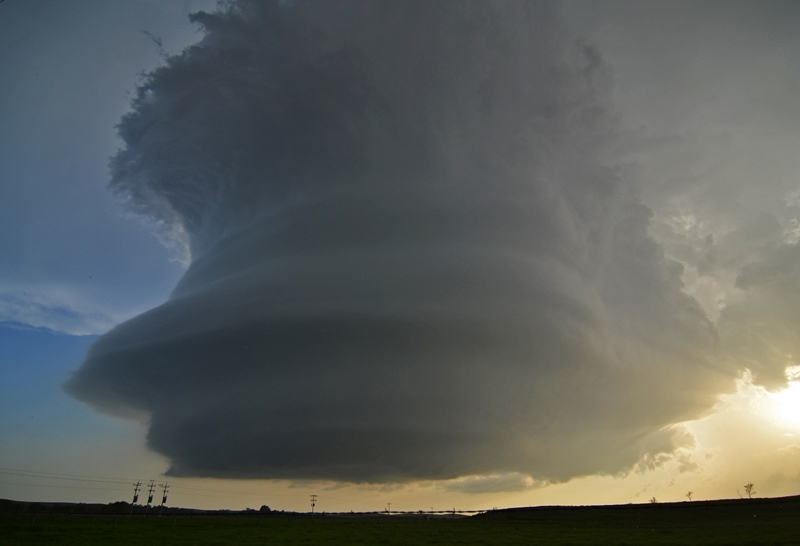 Terrific structure of the LP storm as we approached Arcadia, NE. Another shot of the storm a short time later. Twisting, LP updraft getting tipped over as storm becomes more surface based near Arcadia, NE. Incredible storm with lightning bolt right down through the right side of the updraft. One of the best shots I have ever taken! 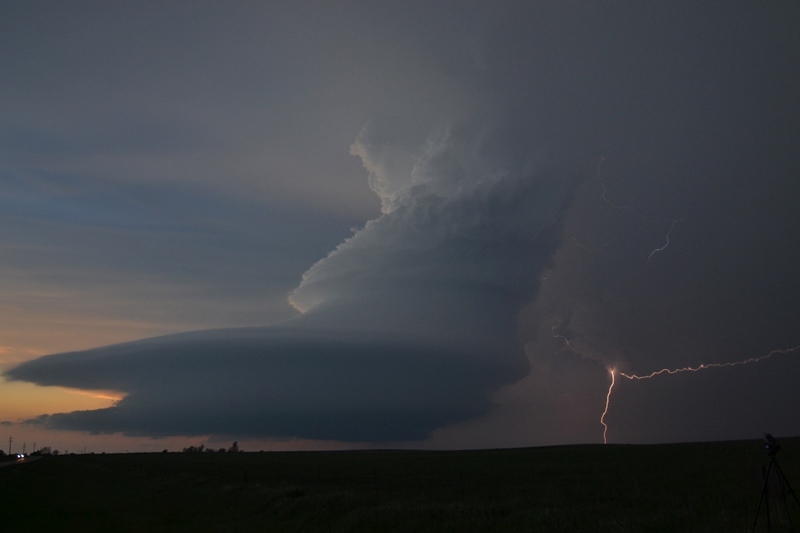 One more bolt as it got dark and we ended the chase for the evening near Ord, NE. 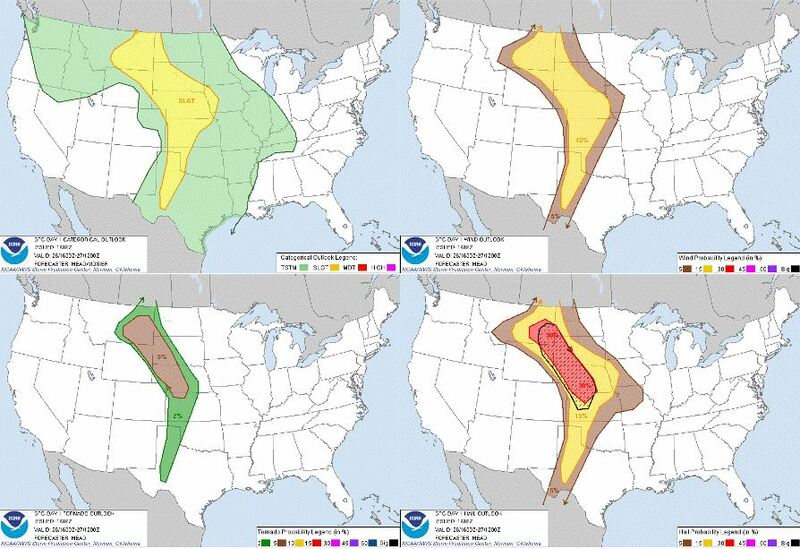 A day with multiple levels of frustration was followed by great reward: We awoke in Spearfish, SD with the intention of chasing in Montana or northeast Wyoming, but a look at the morning models quickly changed our focus to the southern target in central Nebraska. Both targets had issues: The MT/WY target had better shear, but looked to lack the necessary instability to support anything other than high-based storms, even up there in the higher terrain. In NE, the instability and moisture was there to support strong tornadic storms, but the question was whether the shear profile would get it done. The models thought it would, and we needed to be in KS the following day regardless, so we adjusted our target to Thedford, NE, but left very late as we’d initially expected only a 2 hour drive to our target and not the 4-5 hours it would take to get to Thedford. As we headed east on I-90 in the soup north of the warm front, it seemed like we’d never get south before initiation as there was already a developing cumulus field in west Cherry County and a mesoscale discussion was issued. However, as we headed south begging for the cap to hold on until we got down there, the cumulus field more or less died and as we emerged into the sun south of Valentine, NE. When we crossed the frontal boundary, the whole area looked capped to the point where we wondered whether initiation would happen at all. We reached Thedford at about 5:30pm with no sign of anything happening and waited for over an hour before finally towers exploded to our north and east and we were off and running. Between Dunning and Anselmo on Rt. 2, we were faced with a tough decision: The updraft we were targeting to our west was the oldest, but despite the strong convection and broad updraft, it didn’t seem to be doing much, while a younger updraft to the north quickly generated an overshooting top and cloud heights above 50 thousand feet. We continued past Broken Bow trying to decide whether to break off and head north up Rt. 183 to intercept the northern storm, but as we got near Westerville and up along the side of the updraft the structure was incredible! 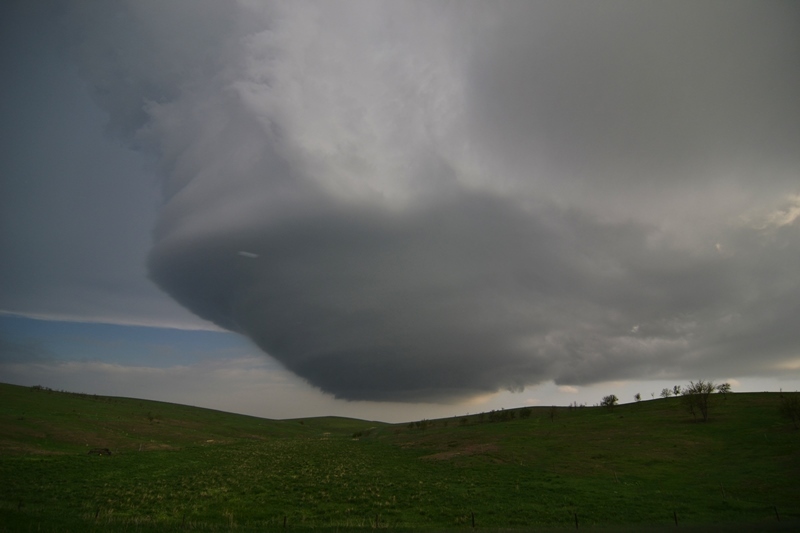 We could not possibly bail on the storm, regardless of what was going on with a tank of an updraft just to our north, so we headed east through the north edge of the hail core and stopped to film the big barrel base with laminar striations on the bottom and a crisp spiraling updraft above. In fact, the structure was so good that we didn’t hesitate getting out to film it despite the golf ball sized hailstones that were falling all around us! Soon the updraft was literally right on top of us and anvil lightning began striking behind us, so it was time to get out of dodge and back in front to continue to watch the storm develop. We passed through Arcadia and stopped again with a more distant view of the magnificently structured supercell, then again moved on towards Ord, still keeping our options open towards heading towards the north storm. Since initiation had been so late however, we decided that even if we did break off and head north we’d never get to the northern storm before dark. When our storm became tornado warned, we decided to focus on it and headed west on dirt roads trying to get a closer look at the base. The road network killed us though, passing through wooded areas and down into valleys that frustrated us over and over, so we popped back out on Rt. 70 and headed west back towards Arcadia, then stopped and watched the unbelievably structured storm, backlit against the setting sun and throwing cloud to cloud and cloud to ground lightning prolifically. The storm by now had a rear inflow band that seemed to extend southwest all the way to the horizon and was just a textbook-diagram looking storm. After spending 30 minutes or so filming the awesome lightning display, we again headed towards Ord to possibly get a look into the notch of our storm, or possibly take a look at the now massive HP storm the northern cell had become. Our cell died though, and as we got to Ord we gave up and headed for our hotel in North Platte. On the way back we were treated to an excellent lightning show from the northern cell that was rapidly plunging south and back building. What a great storm from a day that looked like it was going to be a failure several times!